This book is a fantastic stepping stone for beginners into the enchanted world of ArcPy. ArcPy is a Python site package that provides access to the extensive set of geoprocessing tools available in ArcGIS. Besides enabling programmatic geospatial analysis ArcPy modules also facilitate data management, data conversion and map document management. I think a quote from the Preface pages of this book aptly sums up what the book is all about. As an introductory text your eyes will be opened to how small snippets of code can run geoprocessing tools that can form the basis for extensive geospatial analysis. You won’t find in-depth spatial analysis or data management techniques but you will find an easy to read, easy to follow informative text book that provides the theory behind using Python/ArcPy and will act as a reference to the capabilities of ArcPy. Before purchasing this book I read a number of reviews. While an overwhelming majority applauded the book there where a few who complained about the basic introduction to Python provided. Even though there is a chapter dedicated to creating Python functions and classes one review that sticks out in my mind wanted in-depth object orientated programming for GIS Python which to me is miles beyond the scope of this book. The author does a great job of providing a primer to the Python language but this is not what this book is about. There are a myriad of Python text books for beginners and also online tutorials out there and I would certainly recommend making use of these and getting comfortable with the general syntax, data structures and data types before diving head first into using Python for geospatial activities. 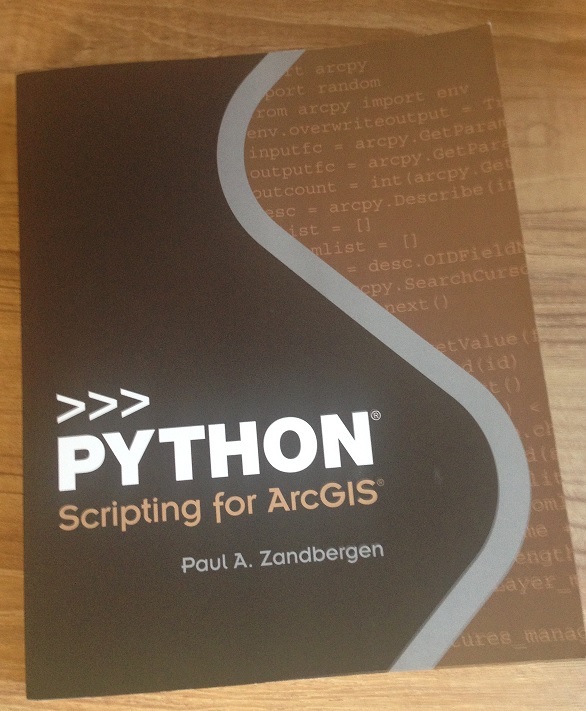 I bought this book because I wanted a foundation for ArcPy that I could build upon. While progressing through the text I was constantly looking to the ArcGIS Resources pages for more information about geoprocessing tools encountered and the syntax required to implement them programmatically. I would recommend using this book in tandem with the Resource pages for the ultimate beginner experience. The book is extremely informative for a beginner’s text but it will be your genuine interest in the material that will take you well beyond what’s on offer here. The book and topics are well designed with each chapter building upon the previous. The first part introduces the Python language, development environments (PythonWIn and the Interactive Python WIndow in ArcMap), and the basics of geoprocessing. Part two is where you begin your ArcPy experience, writing scripts and learning about ArcPy modules and their capabilities. Part three introduces some specialized tasks such as automating ArcMap workflows through map scripting and error handling is also discussed. Part four provides an introduction to creating your own custom tool. Some of the more interesting materials I found covered in this book were; working with the mapping module for automating map document tasks, accessing and manipulating data with cursors and the data access module, working with geometries and rasters, and creating custom tools. These will provide the springboard for you to dive into more advanced scripting. Overall Verdict: The book was a great investment (c. €60). It would be hard to find a better way to introduce yourself to ArcPy. It won’t teach you everything you need to know to build applicable scripts but provides an invaluable foundation. Highly recommended for beginners.